“Why Did God Make Bubbles? & Excuse Me, Sir, But You Are Sitting on My Mother” from Christian Faith Publishing author Janet Simonsen Brown is an entertaining storybook for children featuring two stories—the first focuses on a child’s many questions about why God created the things she sees around her that she is grateful for; the second is a funny tale about Sadie, who is fed up with her mother’s rules about manners, until she finds a situation in which she can “politely” turn it around on her mom, with hilarious results. “Why Did God Make Bubbles? & Excuse Me, Sir, But You Are Sitting on My Mother”: a fun double story book about children being children. “Why Did God Make Bubbles? & Excuse Me, Sir, But You Are Sitting on My Mother” is the creation of published author Janet Simonsen Brown, a recently retired USPS rural carrier; she is a married mother of four living in Cherokee, Iowa. And I do try, I really do. But it’s hard to be polite. With some people, it’s near impossible! Like the time my big sister popped my new balloon. Of course she said it was an accident, but big sisters are tricky; you really have to watch them. Published by Christian Faith Publishing, Janet Simonsen Brown’s new book is a delightful creation inspired by her own children and the brilliant, innocent questions they ask and the perhaps not-so-funny things they do to get back at each other. Back-to-back, these two stories show both sides of childhood, the heartwarming charm of their faith as well as their mischievous side one just can’t help but love anyway. View a synopsis of “Why Did God Make Bubbles? & Excuse Me, Sir, But You Are Sitting on My Mother” on YouTube. 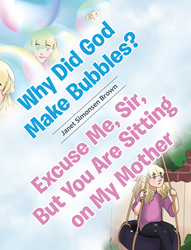 Consumers can purchase “Why Did God Make Bubbles? & Excuse Me, Sir, But You Are Sitting on My Mother” at traditional brick & mortar bookstores, or online at Amazon.com, Apple iTunes store, or Barnes and Noble. For additional information or inquiries about “Why Did God Make Bubbles? & Excuse Me, Sir, But You Are Sitting on My Mother”, contact the Christian Faith Publishing media department at 866-554-0919.